1 Heat a non-stick frying pan with a squirt of Frylight. Add the garlic, tomatoes, sugar and half the basil. Season with salt and ground black pepper and fry for 5 mins until tomatoes are softened. 2 Meanwhile, heat a griddle pan. Squirt the steak on both sides with Frylight and season generously. Fry for 2-4 mins each side – this will give you a medium-rare steak. If you prefer yours well done, cook for a few extra mins each side. Put on to plates and rest for 5 mins. 3 Serve with rocket and Parmesan shavings. 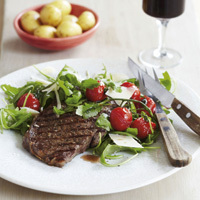 Drizzle over balsamic vinegar, oil and any steak juices. Eat a good supply of lean protein because this will keep you fuller for longer and help maintain good health.